Mario Kart Arcade GP 2 Driving Machine features 32 variations of courses across eight different worlds, with the ability to link up to four players. Multi-player is a blast, and is even more fun than single play. Mario Kart GP 2 features not only familiar characters such as Mario, Luigi and Yoshi, but also welcomes new characters from Bandai, including Pac Man and popular Tamagotchi character Mamechilis. Mario Kart GP2 is available with an optional re-writable card-playing system, which allows players to collect coins and save them on their card each time they play. Coins can then be traded in by the player to customize their cart, and can also be redeemed for hidden items, carts and more. Different classes are also available, which help players of all skill levels enjoy the game. Mario Kart also features live play by play commentary and a camera above the monitor, known as a 'Nam Cam', which projects the player's face onto the screen as their chosen character. For example, players who select Mario will appear wearing the iconic red hat and moustache. 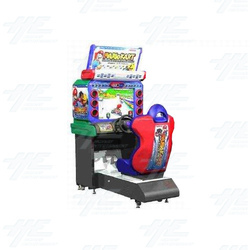 Mario Kart Arcade GP 2 Driving Machine features 32 variations of courses across eight different worlds, with the ability to link up to four players. Multi-player is a blast, and is even more fun than single play. Mario Kart GP 2 features not only familiar characters such as Mario, Luigi and Yoshi, but also welcomes new characters from Bandai, including Pac Man and popular Tamagotchi character Mamechilis. Mario Kart GP2 is available with an optional re-writable card-playing system, which allows players to collect coins and save them on their card each time they play. Coins can then be traded in by the player to customize their cart, and can also be redeemed for hidden items, carts and more. Different classes are also available, which help players of all skill levels enjoy the game. Mario Kart also features live play by play commentary and a camera above the monitor, known as a 'Nam Cam', which projects the player's face onto the screen as their chosen character. For example, players who select Mario will appear wearing the iconic red hat and moustache. Mario Kart GP 2 also uses a Mario Card is the data card (or save file) that appears was copied from Mario Kart Arcade GP and appears in Mario Kart Arcade GP 2. It appears in all sorts of different colors and designs. Gameplay recorded in-house at Highway Entertainment of Mario Kart Arcade Grand Prix 2. The video shows gameplay footage captured straight from the arcade machine's gameboard.The gameplay shows the Tamagotchi character Mametchi completing Yoshi Cup at 150cc.